I’ve said this on my blog, on social media and in real life numerous times but I need to say it again: the highlight of my university experience (after 4 long years) is getting involved with Code First: Girls. 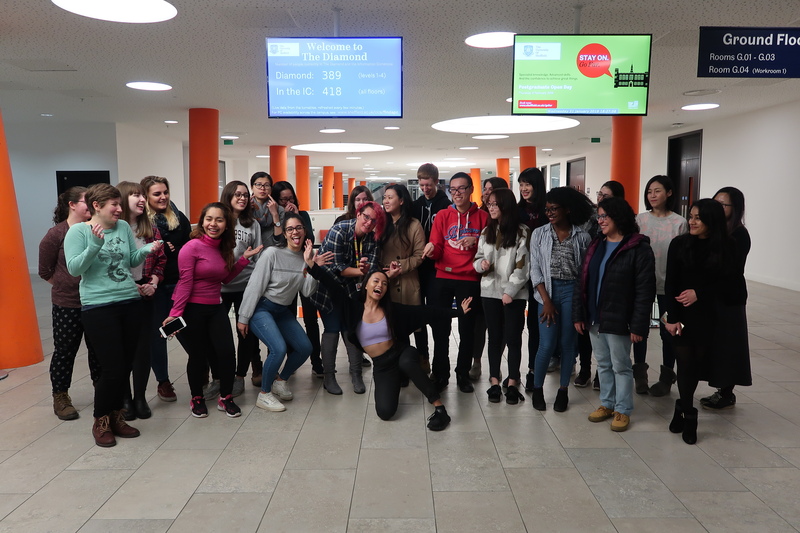 Last month marked my final term working with Code First: Girls in Sheffield and leaving my final class had me reflecting on the last 2+ years, feeling entirely grateful for the first time that email from CFG popped into my university inbox. Fast forward to today, so many things in my life has changed and the positive gains I made during that time, especially professionally but also personal development, was because of this community. Before joining CFG, the only people I could talk to about my favourite hobby of making websites was my family, closest friends and online friends from the blogosphere. It was a huge secret that I was too scared of ever talking about again, because of bullies in the past who made me feel like what I was doing online was embarrassing, was wrong, was a waste of time. But since joining CFG, I’ve met so many people like me. People with different journeys into coding, people who want to learn more like I do, people that do things for the greater future and people who don’t judge me when I excitedly tell them about my online work. I used to code alone in my room, hiding away from everyone else. And when I was in a group, I was in a Computing class dominated by boys. Since joining CFG, I’m always coding with a group of like-minded people with the majority being women. And let me tell you, I’ve never felt so welcomed and so free to be 100% myself. I learnt about things I hadn’t come across in my self-taught journey like Bootstrap, using GitHub to collaborate with others, GitHub Pages as a host and using Flask and Python. Apply everything I learnt to my own personal projects and freelance work. Become more mindful of the fact that just because one person understands what I’m saying, doesn’t mean that everyone else does. One example of this that sticks out to me was when I was a freelance instructor at CFG x Vodafone earlier this year! I initially started at CFG as a Student Ambassador with my main role being to spread the word of CFG and make sure students are engaged in the course. This coincided with my placement year in a Communications Intern role which allowed me to apply everything I learnt from the Marketing/Communications side of my placement to the course – this extended from sending an email to taking over social media every Tuesday and Wednesday evenings. Creation of the #shefcodefirst alumni Facebook group to get everyone connected and engaged with the CFG community even after the course is over. I learnt ways to pass on my excitement and passion to others so that they can get excited and passionate too and… it has become a cycle of genuine love and pride for the community. 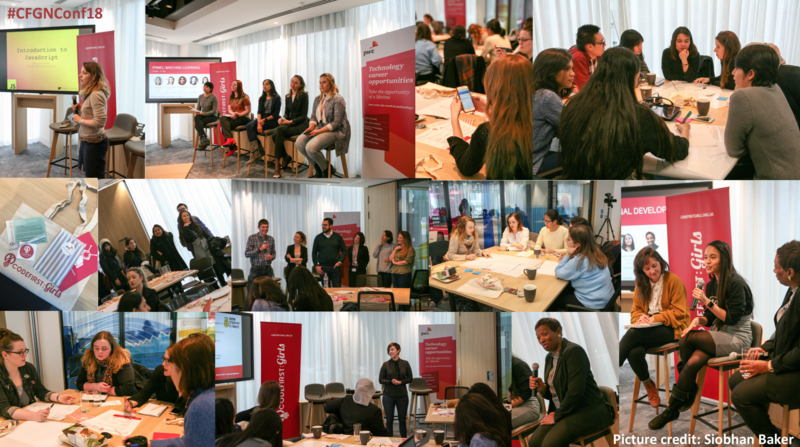 And encouraged me to be creative in ways that I promote the course, whether that’s through blogs or campaigns, like the one I created for IWD 2017: Be Bold for Change that showcased amazing women in the CFG community. This thinking of increasing engagement extended on to class with a post-it note system to help solidify student understanding and after class challenges! For those who have been reading for a while, you’d know that I am a very reflective person (hence why I’m writing this post!) and always eager to improve. Each week after class, I would write down what I thought I did well and what I could improve for next time. This was self-development-gold. I collected points I could use to help make me a better communicator, a better person to work with, a better leader. Throughout the 2+ years, I have definitely seen that I have improved in ways I teach, in ways I listen, in ways I lead. This not only is an excellent way for my professional life in a career but also in my personal life and relationships. 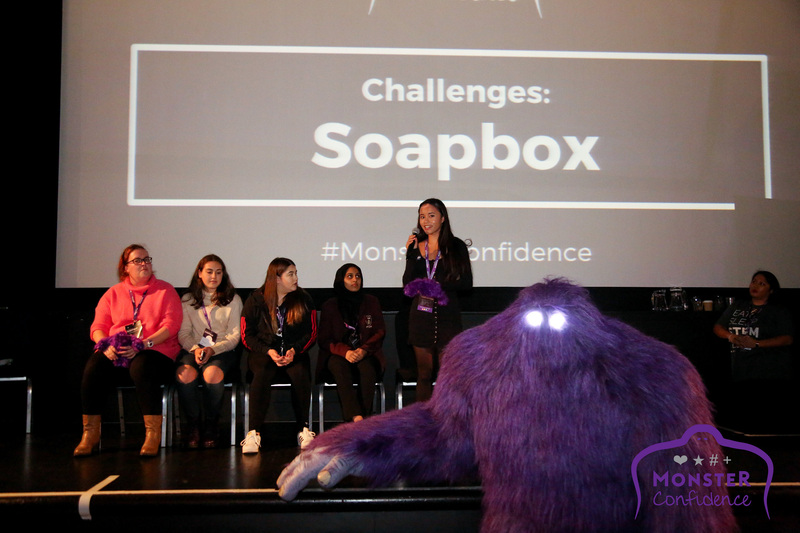 Monster Confidence Sheffield event – I ran up on stage and grabbed the microphone, yes, this is me. This has to be the most significant thing CFG has helped me with. My confidence. It was so fragile before. I was so doubtful and lacked so much belief in my abilities. I never stepped up to opportunities because I continuously told myself that I was never “good enough”. Loved @paulienuh‘s interesting and enthusiastic @sheffieldruby lightning talk, many inspiring things going on in Sheffield tech communities! Being part of the CFG community taught me to step up, speak up, and believe that I can in anything I set my mind to, no matter my gender, ethnicity or background. I can code and can do it well. So, I secured a freelance Web-Development role. My voice and my story matters. I now give talks at conferences, meetups and events on building communities, my STEM journey and online presence. I can make a positive impact (just like I always wanted to!) So helped teach 100+ female students in Sheffield how to code and now mentor others! I can code and can do it well. I developed a sparkly portfolio where I’ve secured some client work! I am capable of pursuing a career in STEM – there IS room for me. TL:DR – CF:G changed my life. 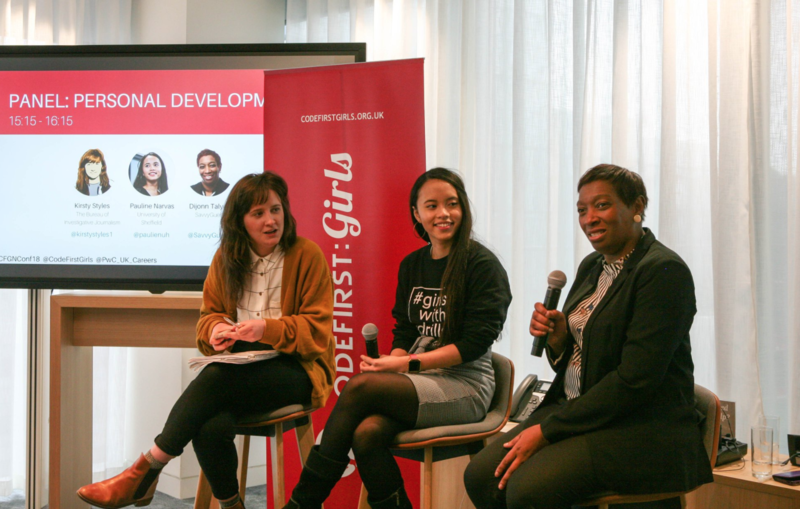 There has never a more exciting time to join the community and get involved – they are truly doing some incredible things, for instance, the recently launched 2020 Campaign that aims to teach 20,000 women how to code by 2020. You can read all the blog posts I’ve written on Code First: Girls here and I encourage you to get involved in your local community today. I’m endlessly in awe of you and this badass group of women! I love beyond words how passionate you all are about coding and making your mark in a male dominated realm. It just makes me smile because women are so freaking AMAZING. Keep doing what you guys do! You’re making us all proud! So happy to hear about the great things that came out of working with Code First: Girls. It’s sounds like such an amazing group of people and I’m so glad you got a chance to meet and teach people who shared your interests. It’s great that so many people are getting into coding now. Hope you enjoyed your final session! I bet they’re really going to miss you! This sounds like an absolute blast. Being around large groups kind of startles me, but it would be a good thing for me to do, getting out of my shell and discussing something that I’m passionate about. I’ve always been very introverted and have kept to myself. I was the same initially but CFG has really brought me out of that shell! 😄 Keep going girl! Thanks so much for your support Megan! 😄 It’s crazy how some things can have a huge impact on you! Wow, that really is awesome how that group helped you grow so much and really get comfortable and love coding to be more open about it and such. I sort of just fell off the coding wagon when I ended up in a job that was more hands-on troubleshooting. However, it has actually made me realize I lean toward programming and someday I would love to go to a good school to learn more about programming. I hope you do Ashely! It’s great that you’ve gained so much exposure and experience over the years. I’m happy that you’ve learned a lot of skills and giving back to the community by being a leader. Even though you’re reaching the end of your uni journey, it’s not the end of your overall ;). I’m proud of you and what you have achieved and learn at CF:G! It is great to have so much passion in coding. I think we have something like Women in Tech in Singapore but I didn’t take part in it. Partially doing all the tech work for a living has drained me such that I want some time outside of tech sometimes. Let me know if you ever need some advice in tech industry! Thanks for the comment Sakura!